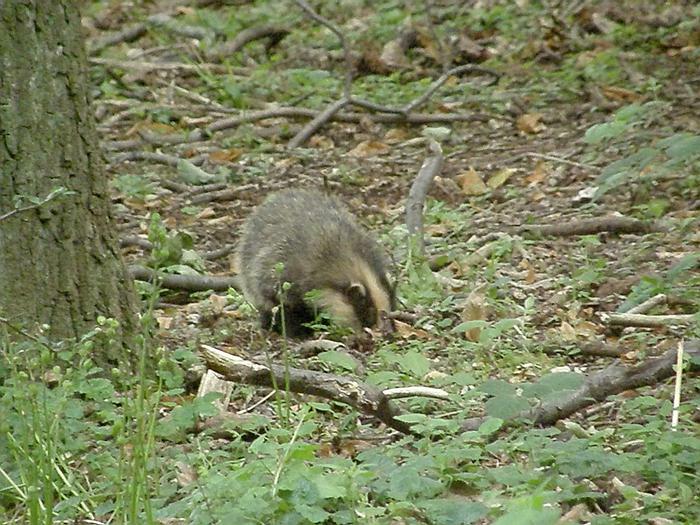 Fieldnotes: 26th July 2008 – Where have all the badgers gone? At last, the summer is back, and it’s been a long, hot day. Having done my chores in the garden, it was time for a trip to the woods for a spot of badger watching. “You’ve got to watch badgers”, I explained to my wife, “badgers need watching! If you don’t watch them, they’ll get up to all kinds of mischief!” How true this turned out to be! It being a nice day, and inspired by reading Pablo’s Woodlife Blog, I decided to have a bushcraft adventure and spend the night in the wood. I stuffed my hammock and a light sleeping bag into my small rucksack and I was off. It was a warm, airless evening in the wood. I climbed my favourite tree, sat on my cushion, and waited. And waited. And waited a little bit longer. By about 8.15 the sun was sinking and there were no badgers in sight. By this time they should be up and out and sitting around the sett entrance. Where have all the badgers gone? Eventually, a badger ambled into view. Not from the sett entrance, but from the east side of the sett. It was the little tiny cub, and as usual it was busy foraging. I couldn’t see what it was eating, but every now and then it would pounce on something, much like a fox pouncing on mice. It didn’t seem to eating anything large, so it could have been catching beetles or insects. The tiny cub (which is less tiny now) seems to be out on its own quite often, but where was the rest of the clan? On an impulse, I turned round and looked behind me. There, about 50 yards away, was the whole pack of badgers. were, rolling around in silent badger laughter, no doubt delighted at having tricked me into watching an empty piece of woodland for the last half an hour! Obviously, they have moved back into the other part of the sett. When I first started watching this sett, three years ago, this was the main area of occupation, but since then the badgers had moved to western end. Now they seemed to have gone back. Is this normal? Did they move to the western end because of the cubs? Had I disturbed them? I shall have to check up on this. Anyway, the badgers were making the most of the fine evening. There was plenty of running around, play fighting and general high spirits. The annoying thing for me was that I was too far away to get a very good view except through binoculars, and several large patches of nettles hid the badgers from sight a lot of the time. They all seemed happy and healthy enough, which was good. The little cub still seems to be a bit of a loner, staying away from the main pack. It’ll be interesting to see if it comes back into the main group later in the year. Of course, because the badgers were in a different place, they were potentially downwind of me. There wasn’t much breeze, but probably enough. Having satisfied myself that all was well, I left them to it and ambled off myself. Having decided to spend a night out of doors, I circled around so that I was upwind of the badger sett, found a couple of suitable trees, and put up my hammock. This is a very comfortable way to camp, especially in a wood where the ground is littered with fallen trees and debris. I chose a spot overlooking a deer trail in the hope of spotting some deer in the morning. I’d love to say that I spent a restful and refreshing night in the wild, but it would be a lie. No sooner had I turned off my light and put down my copy of Jim Corbett’s The Man-eating Leopard of Rudraprayag (a book describing nights spent stalking man-eaters in the jungles of India, and possibly the best thing to read in a wood after dark), than the muntjac started. Generally, I like muntjac. I’ve a soft spot for these little deer. With two exceptions – firstly, they have a habit of sneaking into my garden and nibbling my sweetcorn plants, which I take very personally. Secondly, the barking. If you have never heard a muntjac bark before, then it is hard to describe what it is like. The sound is a cross between a bark and an unearthly scream, and in a quiet wood it is unbeliveably loud. It is hard to imagine that such a small deer could create such a loud noise. I was walking out of the wood one day when a muntjac started barking, and I could still hear it when I reached my house, three-quarters of a mile away as the crow flies. The terrible thing about muntjac barking is that they bark about every five seconds, regular as clockwork, and they can keep it up for hours. I honestly don’t know why muntjac bark. It may be as an alarm call, or a way of attracting other muntjacs, or a way of warning them off. I suspect it may be for all of these reasons. So there I was. I had one muntjac barking away about a hundred yards to my left, and another barking back at it about a hundred yards to my right. To add to the cacophony there was a tawny owl crying somewhere overhead. I may sound a bit churlish. You would think that as a naturalist I would enjoy this. This is what being close to nature is all about. Perhaps you’re right, I should appreciate it more. Nevertheless, it wasn’t the best night’s sleep I’ve ever had. I’ll have to work at this bushcraft thing. On the face of it, it wasn’t the best of days. The wind was gusty and the dark clouds threatened rain, as if a summer storm was brewing. But it had been a couple of weeks since I’ve been down to the wood, so I went anyway. A short (but very enjoyable) walking holiday and the inevitable long hours at work have conspired to keep me away until this evening. One of the fields I walk through on my way to the wood has wheat in it this year, and there are signs that the badgers are already starting to feed on the ripening grain. Feeding on cereals is often seen as something that badgers do in drought conditions when worms are hard to come by. This year hasn’t been especially dry, so I imagine the worms must still be fairly plentiful, yet they seem to be eating the corn anyway. Perhaps it is just an easy source of food. Perhaps they just like it. The best indicator of cereal eating in badgers is to examine their dung. I’ve never stooped so low as to start poking around in it, but you can tell a lot about what the badger has been eating just by looking at it. I took this picture this evening. 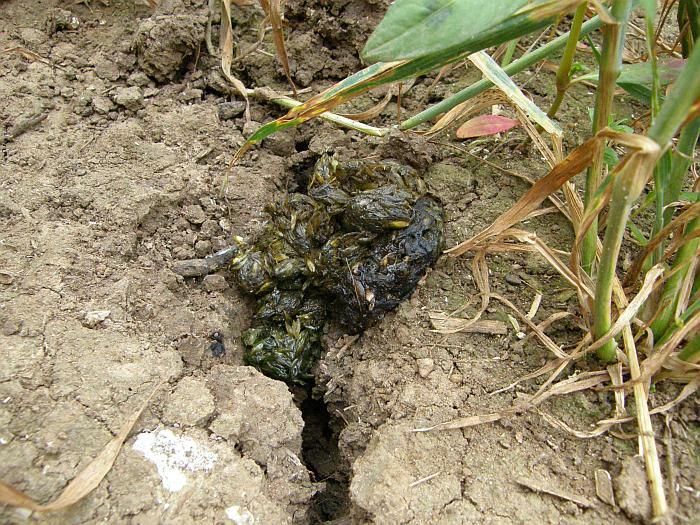 The dung is green and full of cereal grains, in clear contrast to the brown, earthy dung you typically get with an earthworm diet. The wind was blowing from an odd direction, so I had to approach the sett from a different way to usual. I’ve mentioned before that you should always approach a sett quietly and from downwind. This proved to be very true today, since one of the badgers was out and about early. I arrived at about 7.00pm, and since the badgers have usually been emerging about 8.00pm or so, this one was very early. With my best attempt at cat-like stealth I crept up behind a tree about 20 yards from the sett. I was downwind, so I was pretty safe from discovery, and if I didn’t make any noise the badger was unlikely to notice me. It was a badger cub, and from the size of it, it was the tiny cub I had noticed last time. It was busy foraging, pushing its nose into the leaf mould and grubbing about; indeed the ground all around was pock-marked with dozens of little snuffle-holes where it had rooted out worms or bugs. I don’t know if it is the runt of the litter. Do badger litters have runts? Is its small size connected to the fact that it was out early, and obviously feeding with some enthusiasm? Perhaps it is a younger cub from another litter and has some catching up to do before the lean months of winter. I have a lot of questions, but no answers yet. I peered out from behind my tree and took a quick video. It became clear to me now I was here that the wind was entirely wrong for any decent badger watching tonight. There was nowhere downwind that offered me any cover and yet allowed a view of the sett. The only cover available was virtually on top of the sett, or nearly as bad, right next to the main badger paths. If I stayed there until the rest of the family came out I was certain to disturb the badgers in one way or another, so reluctantly I backed away and left the little cub to it. Click here to visit YouTube and click on ‘watch in high quality’ for a better view. It was frustrating not to get my fix of badger watching for the night, but that’s how it goes. There was no point in staying and trying to make the most of a bad situation. As a consolation I sat in the field for a while and watched the local buzzard performing acrobatics, swooping and diving in the strong wind. All buzzards are quite spectacular birds, looking as they do like little eagles, but this individual is quite a show off. I’ve watched it before as it’s flown through the wood itself, swerving and dodging around the tree trunks and crying out its mewing call, and that’s a sight to see. I watch the buzzard slowly disappear eastwards, and for a change I walk home while it is still light. Fieldnotes: 13th June 2008 – Out of my tree! Despite the threatening rain clouds I decided to pay a visit to the wood on Friday evening. It’s a good way to unwind after the working week. Like most people, I spend my time rushing everywhere: rushing to work, rushing to meetings, rushing home. Watching wildlife forces you slow down, to stop and listen and think. The slight wind was blowing in an unusual direction. Wooded valleys seem to have an uncanny influence on the wind. It is not uncommon to have the wind blowing one way outside the wood, and in another direction entirely when you’re actually inside it. The practical upshot of this was that all of my usual trees would put me upwind of the badgers. This would not do at all, so I circled around the sett and sat on the ground with my back to a large oak. The first thing I noticed was how many nettles there were. I was sitting on a few, but being a rough, tough badger watcher I couldn’t let myself be too put off by that. The nettles also grew around the sett entrance, putting a bit of a screen between me and the badgers. Not good for a clear view, but good for keeping the badgers relaxed. The cubs came out at about 8.15pm. They are getting very independent now, and seem perfectly happy foraging around the area of the sett. The adults emerged about 45 minutes later. The whole group seems very relaxed and content at the moment. I suppose that life must be good for a badger just now. The wet weather means that the worms that make up most of their diet are plentiful and easy to catch, and that must take some of the pressure off the food gathering. One of the advantages of being on the ground was that I was closer to the badgers than usual, which gave a new perspective on things. I sat there for a good hour and a half, my legs slowly going numb underneath me and a small cloud of mosquitoes gathering about my head, but with a great view of the sett. The downside of being on the ground was that I was more likely to come into contact with the badgers. As I’ve said before, one of my rules for badger watching is to avoid disturbing the animals. Sitting in front of the tree it was surprising how little notice the badgers took of me. I was wearing full camouflage gear including gloves and face net, so I should have been quite inconspicuous. However, eventually the inevitable happened. One of the foraging badgers circled round and approached me from the side. From this position my silhouette must have been visible, because it stopped, stared and then trundled quickly back to the sett. Not wishing to put the badgers off their foraging, I slowly straightened my cramped legs and crept away as quietly as I could. After 30 yards I turned round and I could see the cubs ambling about, so they seemed happy enough. All in all an interesting evening. I think I still prefer my trees. They offer so much more concealment.. There’s been many times when I’ve had badgers scuffling around the roots of the tree I’ve been sitting in, and they’ve never suspected. One good thing from the night is that I think I’ve finally got an individual badger I can recognise. The coats of most badgers are greyish-black, with a reddish-brown tint beneath, but the fur of this one was quite white underneath the grey. He also had a patch of white fur visible below his left ear. I say he, because he looked well-built like a boar, but I could be mistaken. I’m no expert on sexing badgers, except when I see them with cubs or exposing their undercarriage as they scratch. I shall look out for this particular badger on subsequent visits. My efforts to build up a video archive of the badgers continue. I’ve discovered how to set my camera to take high quality video, but it only does it for 15 seconds at a time. I’ve spliced all the footage for the evening into one montage. I’ll have to read the camera manual, but I guess in the meantime I’ve got a video that is ideal for people like me with 15 second attention spans! For a better look at the video, click here to go to YouTube and select ‘Watch in high quality’. Today I’ve figured out how to embed video, so there’s no stopping me! I discussed musking on the last post, and I’ve got an example on video. This is the first video I ever took, so the quality is not brilliant, but you can get the idea. I’d put down a small patch of peanuts and the adult badger found them first. The two young cubs then came rushing in. Badgers have a neat trick of shoulder-barging each other out of the way, and then sitting down on the food so no others can get to it. The adult boar was having none of it. He gets up and then musks on each of the cubs in turn before moving off. Whether this was a show of dominance or fatherly affection I don’t know, but it’s a good example of the behaviour. It’s been a while since I’ve been to the wood, what with work commitments and other matters, so I was keen to see how the cubs were getting on. The last two weeks have seen a lot of rain, but today was quite sunny. The rain has given us a lot of lush vegetation and the wood is a bit like a rain forest at the moment. The nettles at the gate are now as high as my shoulder! Anyhow, there were very soon at least ten badgers at the sett entrance, the five cubs and at least five adults. They were all quite happy, enjoying the pleasant evening, sitting around grooming and playing. The older cubs are getting to be quite a handful, but there are two who are still smaller and quieter. Are these females? Do females develop slower? Or are they just late developers? The cubs are ranging further afield now, and going off foraging on their own. They still stay within about 100 yards of the sett, but they are definitely getting more independent. There is still the usual play-fighting and wrestling going on, but they seem to have calmed down a little and are getting on with the business of finding food. Interestingly, I saw one of the cubs musking another cub, so it seems as if they are already defining relationships in the group. Musking is an activity that may need some explaining. The badger belongs to the mustelid family, which also includes weasels, stoats, otters, polecats and martens. One of the key features of these animals is that they communicate by scent, having a musk gland under the tail that secretes a powerful-smelling oil. This is used to mark out a territory, and in the case of badgers, to mark out family members. Badgers mark their territory through the use of specific ‘latrine’ sites or dung pits. These are located at the edge of their patch, and are visited regularly. The scent at these sites warns other badgers out of the area. These dung pits are a useful way to identify the territory of different badgers. You can also use them to find out what the badgers have been eating. I’m not dedicated enough for detailed analysis, but as a rough guide badgers that have been eating their usual diet of earthworms will leave ‘earthy’ dung. In late summer, the dung is often crammed with wheat from the fields, showing the change in diet. There are a few cherry trees in our area, and in the autumn the badger dung is often dark red and a mass of cherry stones. I’m curious to see what happens to the family. Will all the cubs stay at the sett, or do they go off and make their own way in the world? I guess I need to work on identifying individuals and keep watching over the year to answer that question. At the end of the evening, one of the cubs started exploring in a whole new direction. There is a tree at the sett that grows at an angle of about 45 degrees. The cub managed to climb onto this tree, and proceeded to amble upwards. Very shortly it had climbed about 25 feet along the tree, and was about 12-14 feet off the ground. I wondered if it would get stuck. We had a cat once that would climb trees, but could only climb upwards. When it came to coming down again she was much less graceful. The badger cub on the other hand seemed quite at home in the tree, and when it reached the end of the trunk it turned round and ambled down again. I’ve seen badgers climbing trees before, and they always seem a bit out of place, being low-slung, solid animals, definitely suited to life on the ground. I suppose they are related to Pine Martens after all, so it may be a family trait. As it was getting too dark to see, a muntjac barked loudly nearby and all the badgers scrambled down the nearest sett entrance. I took that as my cue and slipped down from my tree and headed home. Here’s a short video of the badgers at the sett. A skylark was singing over the fields as I walked up to the wood, and a cuckoo ‘cuckoo’d’ as I walked back, so I suppose it must be nearly summer, but with a chill wind and towering black clouds it felt more like February than late May. But I shouldn’t complain about the wind. A good breeze is the badger watcher’s friend. Badgers see only poorly, and their hearing isn’t great, but their sense of smell is something like 800 times more sensitive than ours (sounds like the beginnings of a bad joke – “how does a badger smell? – terrible!”). If they catch a sniff of human scent in the air they’ll be back in the sett before you know it. Providing you’re sat in the right place, a nice breeze carries your scent up and away from the sett, and the badgers will hardly suspect you’re there. The badgers emerged from the sett a few minutes after 8.00pm. There are five cubs at the sett this year; one litter of two and another of three. When they first came out into the open in late April they were very unsteady, never venturing very far from the sett entrance. Now they are like boisterous children, much to the exasperation of their parents, and spend their whole time chasing each other around and play fighting. The play fighting looks quite vicious at first sight, with cubs wrestling and rolling over each other, trying to get a playful bite. They don’t seem to do each other any harm though, and the atmosphere is definitely light-hearted. I suppose the thick fur prevents their teeth from really making contact. Occasionally one will give another a harder nip than usual, causing a sharp ‘yip’ cry, but this is not frequent. The adults usually try and keep a respectful distance , but at times even they get drawn into the fun and play along with the cubs. Life at the sett goes on as normal though, even with a gang of rowdy kids running around. One of the adult sows was busy collecting bedding. It is usually said that badgers prefer dried grass or bracken as bedding, and this may be true in autumn and winter, but at this time of year they seem to favour greenstuff. This may be due to convenience, as the whole area around the sett is carpeted in a thick layer of foliage (bluebells and ground elder mostly) so the badgers do not have to go far to collect a good bundle. To see a badger grabbing a ball of bedding in its forepaws and shuffling backwards with it towards the sett is one of the classic sights of badger watching. Sometimes they seem very preoccupied with the task and oblivious to the world around them, whilst at other times they’ll stop every now and then and sniff the air, perhaps self-conscious about being spotted in such an ungainly pose. Lately, I’ve been trying to take both video and still pictures at the sett, partly to prove to my wife that I really am watching badgers and that there is no sinister reason behind me creeping out of the house in the evenings wearing camouflage clothing, but mostly to try to identify individual badgers and to start to analyse behaviour. I’ll write more about this subject at some point, but if you want to see some of the events of the evening, here are the videos on YouTube.